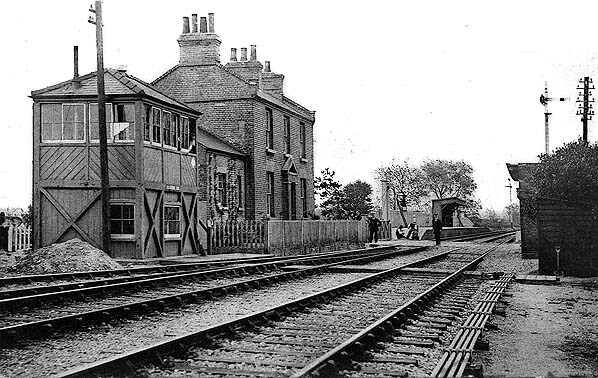 Notes: When the single-track line opened between Cambridge and the junction with the Newmarket & Chesterford line, one mile west of Six Mile Bottom station, on 9 October 1851, Fulbourn station was not ready. It probably did not open with the line and did not appear in Bradshaw until August 1852. It had a very similar building to the other new intermediate station at Cherry Hinton and was sited on the west side of Hay Street (renamed Station Road in the twentieth century). The station was provided with a two-storey brick station house beneath a pitched slate roof with two single-storey wings, one at the rear and the other facing onto the platform at the west end. A ticket window, protected by a porch in later years, was located in the end wall of the building facing onto Hay Street. The doorway at the front of the building decorated with plain pilasters and a pediment opened onto a short low platform. This feature was found on many Newmarket & Chesterford buildings, including crossing keepers' cottages. In the early years trains only ever stopped at Fulbourn station by request. The Eastern Counties Railway timetable and map of 1853 shows the spelling of the station as Fulbourn (which is the accepted spelling of the village) and the February 1863 Bradshaw also shows that spelling but by the twentieth century the station had become Fulbourne, and this incorrect spelling appeared in all timetables and on tickets and station signs until closure. With the coming of the railway, a community built up around the station. The ‘Railway Tavern’ opened to the south of the station in 1858. It survived into the 1960s but with declining rail traffic it was forced to close. It was bought by local farmer John Lacey and two years later, in 1966, the building was demolished. A steam mill had opened to the north of the station by 1863. It worked into the 1930s and finally closed in 1963. Doubling of the track was first mooted in late 1874; this included ‘single line alterations, additional sidings, signals and platforms’ at a number of stations on the GER system. Curiously, the cost for the changes at Fulbourne was stated as being £4,085 - roughly twice the cost of alterations elsewhere. However, a further entry, in the GER company records for Dec 1874, gives the aforementioned £4085 as being the cost of ‘line doubling of the Fulbourne Branch’. In October 1874, plans were discussed for a ‘passing place’ at Fulbourne and in June 1875, signalling works at Fulbourne were agreed at a cost of £579; Saxby & Farmer were the contractors. A signal box with an 18-lever frame was built at the west end of the stationmaster’s house in 1885. Fulbourne was a fine example of one of the earliest standard signal boxes of the Great Eastern Railway. Although first seen in the 1860s, standard contractors’ designs were the norm until 1873. The box controlled access to the goods yard but the level crossing gates were always hand-operated. 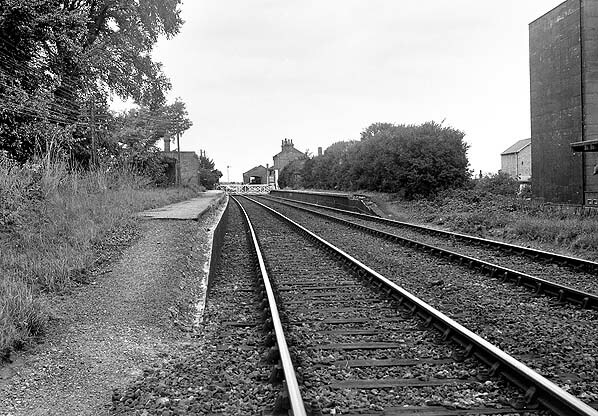 With the doubling of the line the station was re-sited to the east side of Hay Road. The new station had two facing platforms, the up platform being longer than the down. In April 1886 approval was given for ‘station alterations’ at Fulbourne, the cost being £270, and these alterations included the building of waiting rooms and the provision of toilets. 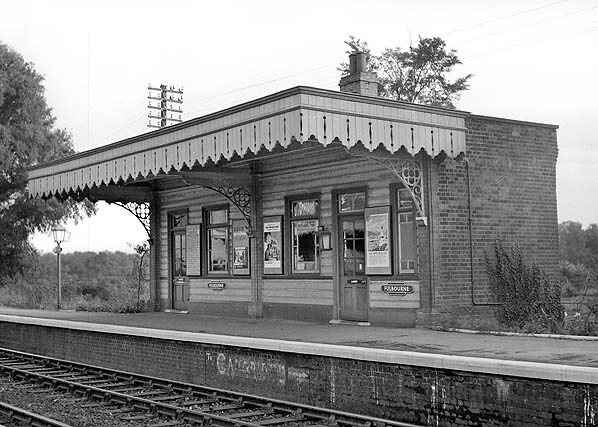 The up platform had a small brick building with a flat canopy supported on three decorated cast iron brackets on columns. It had a fretted valance which stretched the full width of the platform. The building comprised two rooms, a waiting room and a ladies’ room. Further east along the platform there was a brick gents’ toilet. The down platform was provided with an open-fronted timber shelter with a slightly sloping narrower canopy. The shelter was divided into three bays; two had seating while the third was for storing barrows. There was a barrow crossing between the platform and the level crossing. The original booking office on the other side of the crossing, with its ticket window and porch, was retained until closure of the station. A rectangular brick building stood opposite the station house on the west side of the level crossing. This might have been part of the original station or it may have been built when the station was resited to the east side of the level crossing. It was known locally as the 'Ladies' waiting room'. In later years it appears to have been used as a permanent way tool store. The goods yard, which covered nearly two acres, was to the west of Hay Road on the down side. In 1885 this comprised a siding entered by trailing points that ran through a brick goods shed with a loop round the south side of the shed; at its west end the siding split into two. The shed had a canopy on the north side to provide weather protection for goods being loaded onto, or unloaded from, road vehicles. The shed was extended in the late nineteenth century. Coal merchant Staveley Coals stored house coal, steam engine coal and brickyard coal at the yard. There was also a siding on the up side. During the latter years of the nineteenth century a number of excursions ran from Fulbourne, which included an ‘Excursion to Ipswich and a boat ride to Harwich’ in 1866 and ‘Pantomime in London’ in 1881. Early stationmasters at Fulbourne included Richard Dalley (1881), Richard Hornford (1891) and Ernest Orman in 1901. In 1940 large concrete silos were constructed to the rear of the down platform. They were built by the War Office as part of their Strategic Food Storage Programme, to hold wartime emergency supplies of wheat and barley. The silos were not initially rail-connected but, after discussions with the LNER in 1942, a trailing siding from the down main line was laid into the works; this split into two sidings embedded in concrete between the silos and the down platform. Fulbourne goods yard closed 18 April 1966 although a private siding remained in use after that date. Passenger services were withdrawn on 2 January 1967. 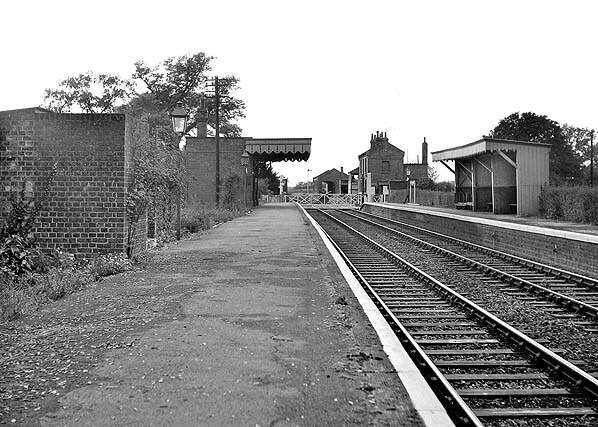 Within two years some of the platform edge stones and the waiting room canopy had been removed. 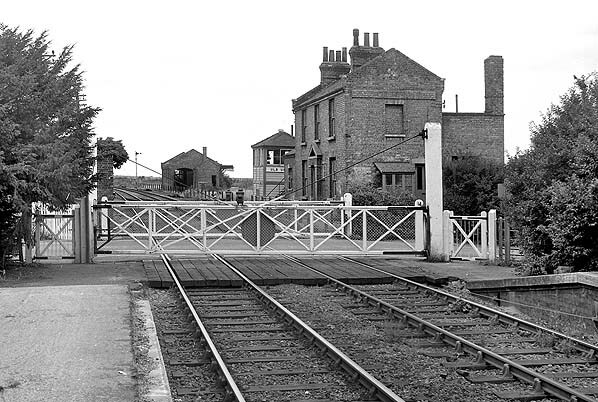 By 1975 the stationmaster’s house and the down platform shelter had been demolished. Between 1979 and 1982 The Fielding Industrial Estate with several warehouses was laid out on former goods yard. The waiting room on the up platform survived into the 1990s. 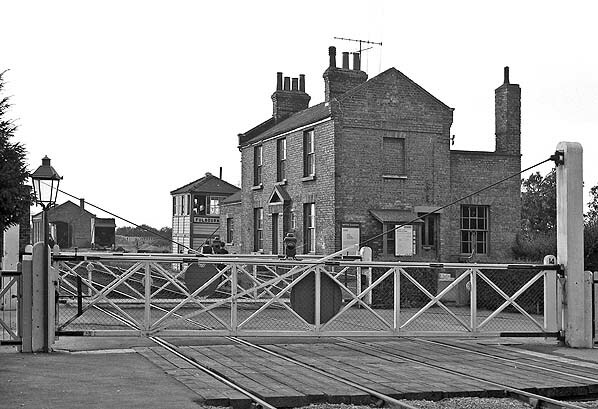 The line was singled in 1983, and the signal box was closed and the level crossing automated under the Cambridge resignalling scheme on 8 May that year, and the box was quickly demolished, probably soon after the down track was lifted in October that year. About 400yd of the down main line east of Fulbourne station was retained to give access to the grain silo siding. In 1986, Vogan Limited, part of the Banks Group, took over the silo and refurbished it for continued grain storage – particularly malting barley. The siding remained in use until c1990, the same time as rail traffic ended at the Dower Wood silos at Newmarket. Today Vogan is part of S&B Herba Foods Limited and the plant handles the milling of rice, plus the splitting and polishing of dried peas and lentils for most of the UK supermarkets and food processors. The sidings are still in place as is 400yd of the old down main line which ends at buffers alongside the former down platform. There is no longer a connection with the still-used up line. Re-opening of the station was proposed by Cambridgeshire County Council in May 2013 as part of an infrastructure plan to deal with projected population growth up to 2050. Route map drawn by Alan Young. Bradshaw from Nick Catford. Tickets from Michael Stewart (except 2178 Darren Kitson). Totem from Richard Furness. Looking east towards Fulbourne station c 1910. 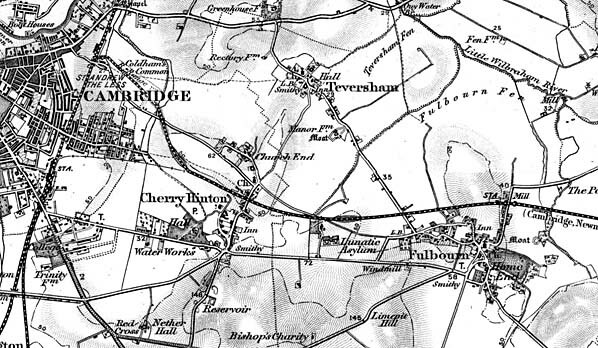 1898 1" OS map shows Fulbourne station on the west side of Station Road. 1961 1" OS map shows Fulbourne station on the east side of Station Road. 1902 1:2,500 OS map shows the layout of the station and goods yard. The two platforms with waiting rooms are on the east side of Station Road; the down platform is noticeably shorter than the up. The stationmaster's house, which includes the booking office, is on the west side of the road on the down side; Fulbourne signal box is immediately west of the house. There is a building of unknown purpose opposite the house. The goods yard is on the down side to the west of the signal box and is reached by trailing points. It comprises a siding passing through a brick goods shed with a loop round the south side of the shed. The building to the rear of the goods shed is a later addition and did not appear on the 1885 map. There is also a siding on the up side. 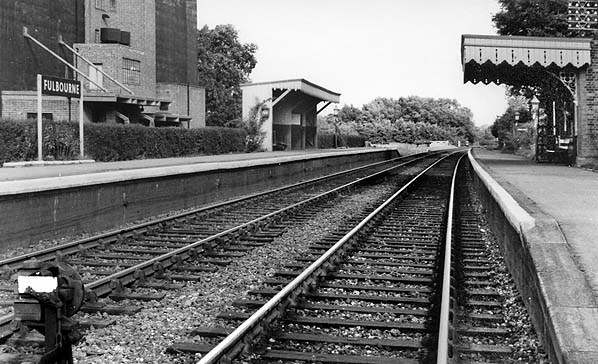 Fulbourne station looking west from the up platform c1950s. The stationmaster's house is seen on the far side of the level crossing with the porch on the end wall providing weather protection for the ticket window. To the rear of the house Fulbourne signal box and goods shed are seen. A closer view of the Fulbourne booking office window c mid 1960s. The goods shed has a canopy on the north side for handling goods that arrive or depart by road. 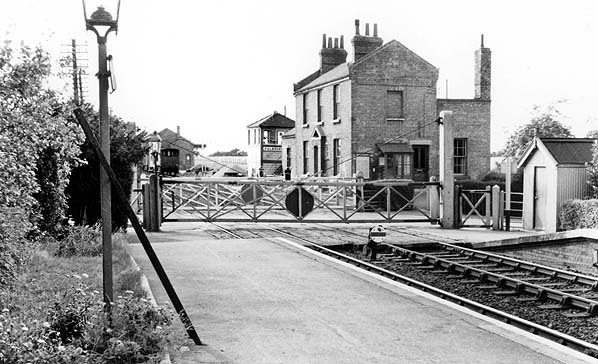 Fulbourne station looking east from the level crossing c mid 1960s. The building behind the down platform is a silo built constructed in 1940 by the War Office as part of their Strategic Food Storage Programme, to hold wartime emergency supplies of wheat and barley; it was rail connected. The brick waiting room on the up platform at Fulbourne station c mid 1960s. The general waiting room on the left with the ladies’ room on the right, All the stations on the Newmarket Railway were fitted with BR Eastern Region blue totem signs in the 1950s. Those at Cambridge and Newmarket were, however, short-lived, being replaced with illuminated signs on concrete posts. 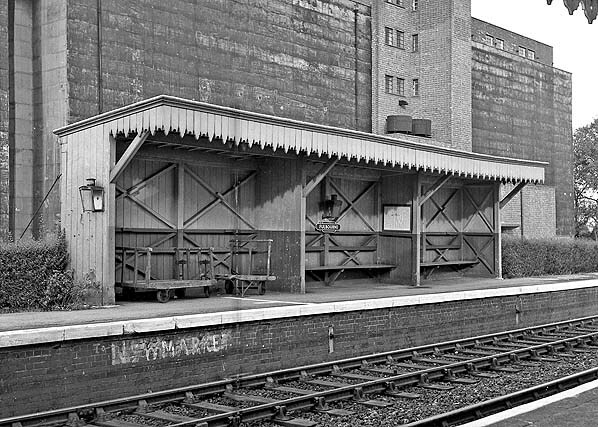 The down platform at Fulbourne was provided with a two-bay open-fronted timber shelter. Two of the bays had seating, the third was for barrows. The WW2 grain silo is seen to the rear. was in the ladies' room. 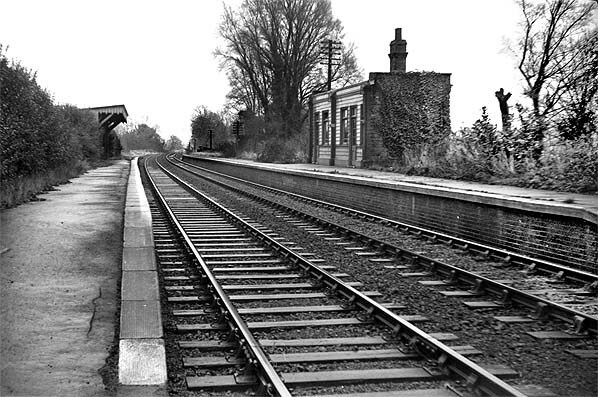 Fulbourne station looking west c 1969. Note that the down platform is considerably shorter than the up platform. The building in the distance on the right, partly hidden by the grain silo, is a corn mill.